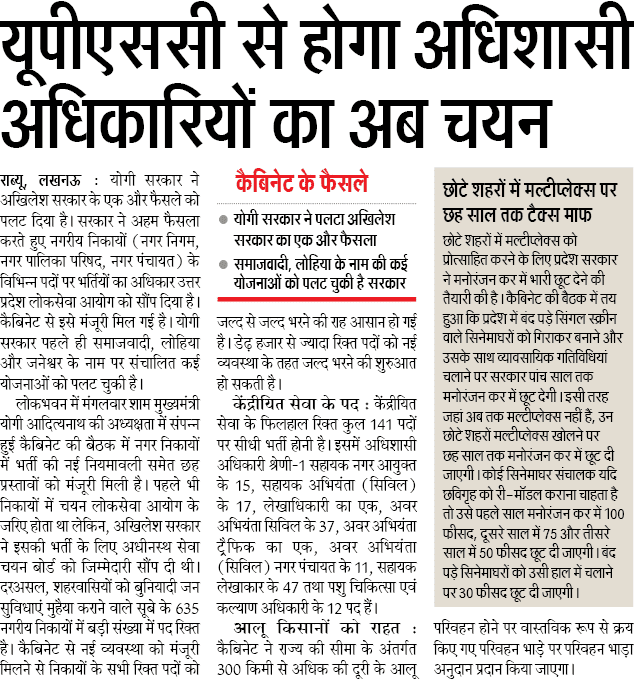 UP Nagar Nigam Executive Officer Vacancy 2019 Adhisashi Adhikari 635 EO Bharti News UP Nagar Nigam Executive Officer EO Vacancy 2019. UP Nagar Nigam Executive Officer Vacancy 2018 Online Application are invited to fill 635 UP Nagar Nigam EO Vacancy in 2018 along with Junior Engineer in Civil, Assistant Accountant etc. On 20th July UP Government changed the selection process in department of Nagar Nigam, Nagar Panchayati, and Nagar Palika Parishad. That if any type of Group A to Group B vacancy will be filled it will be open by UPPSC (Uttar Pradesh Public Service Commission). However through direct recruitment 141 Vacancy JE, Assistant Accountant, Lekhaadhikari starting soon. 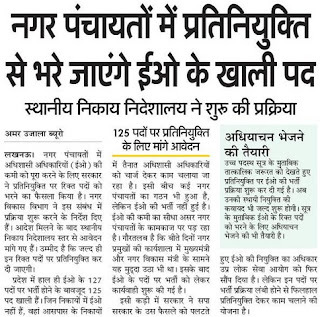 UP Nagar Panchayat Adhishasi Adhikari Recruitment 2019: latest news 26/1/2019 UPSSSC have generated 107 vacancies of Executive officer opening from 30 January 2019. Last date to fill application form is 19 February 2019. 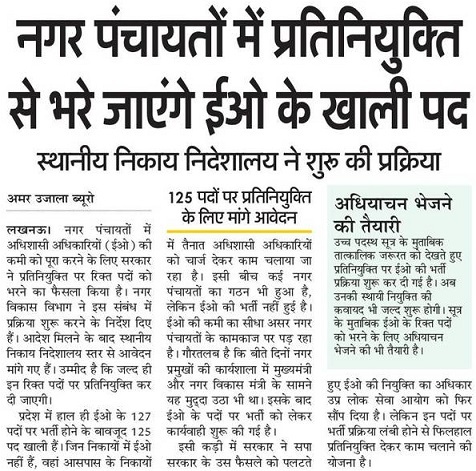 UP Nagar Nigam Pratiniyukti: Latest News 25 November is 125 EO vacancies filled on pratiniyukti basis if someone wants to apply for Executive Officer jobs than they should contact sthaniya Nikaya Nideshalaya, Nagar Panchayat for more details. UP 400 Nagar Nigam EO/Adhishasi Adhikari/JE Vacancy 2018: More than 400 Vacancies is updated on 4 October from Nagar Department of Uttar Pradesh. 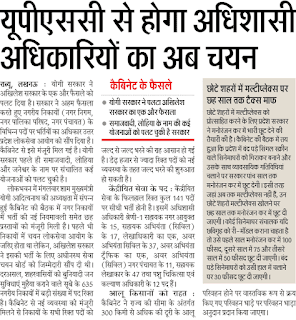 The 400 Posts are of 400 Junior Engineer and Executive Officer Vacancies. Department: Jal Nigam, Adhinasth Sewa Chayan Ayog, UPPSC, Nagar Nikay, Nagar Nigam. Total Number of Vacancies: 400. UP Nagar Nigam EO Vacancy 2018: Latest Update 21st July that Huge amount of posts are to be fill in Nagar Nigam such as 40,000 Safai Karmi, Nagar Panchayati Clerk, Junior Engineer and Assistant Accountant. Previous government given the responsibility to UPSSSC (Adhinasth Sewa Chayan Ayog) but now transferred to UPPPSC (Lok Sewa Ayog). Educational Qualification Details: Should have Master’s Degree /Bachelor’s Degree/ Diploma in relevant fields from recognized University/Institution. Selection Process: Candidates shortlisted after Preliminary, Mains Exam. Who Qualify would be called for Interview and Screening Test. Application Fees: Candidates have to pay an application fees according to category should be paid only by way branch of the SBI by cash or by using net banking of the SBI or by using visa/ master credit/ debit card. How to Apply: The candidates have to submit the application form from uppsc.nic.in which should be in computer. More information about how to apply can be getting from the Official Notification given on the Official Website.